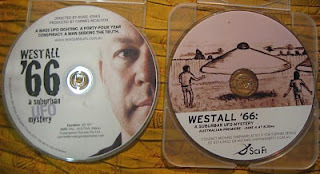 You probably remember that Aussie Ufo documentary that aired earlier this month on SCiFI. Well just an annoucement that you can now get it on DVD here to watch if you missed it. The producer has gone through extensive research for 3 years to put out this amazing feature, and with the lack of good Ufo documentaries out there, I urge everyone to support her great work . 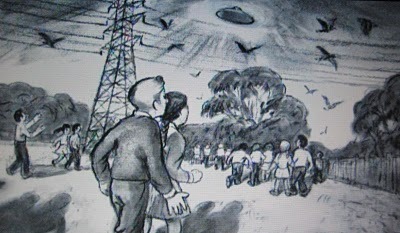 Many saw the strange object descend behind pine trees in The Grange Reserve, and then later ascend and fly away at great speed. The people who ran over to the reserve found a huge ring in the paddock where the object had been seen. Some people reported five light aircraft following or chasing the object." Director Rosie Jones came across the story via a story in the Melbourne Age which connected her to the efforts of Canberra academic Shane Ryan to get to the bottom of the enigmatic events. After 3 years of solid research, filming & editing we have the opportunity to view the result of all those efforts. i prefer to download the torrent. i do not have the funds to pay for the dvd, esp. since the tv show was broadcast for free originally! Ditto lnlisa. I am a photo artist of the starving variety and cannot see paying for a DVD that was originally a FREE broadcast. We don't need to further support a documentary that already made big bucks. Producers are paid nicely for their efforts and demanding further financial gains from us is not called support, it is called, "GREED". As the director of the documentary, I can assure you that we didn't get the "big bucks" you're talking about! I researched unpaid for three years and we made the film on a tiny little budget which didn't pay us or anybody else proper wages. A few documentary producers receive reasonable wages for their work, but in Australia, most don't. Because a documentary is broadcast on free-to-air TV, it doesn't mTV station pays (in our case, very llittle) to broadcast the show but they don't own it. It is copyrighted to us and downloading it is illegal. It also doesn't support other starving artists like yourselves who haven't been paid for their work.